Google now includes a “see inside” option when profiling businesses in search results. 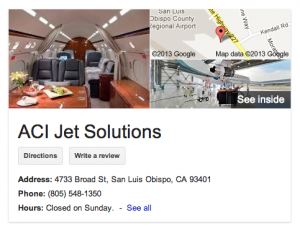 A new online tour in San Luis Obispo at the airport was created for ACI Jet Solutions by Access Publishing. It allows customers and the public to take an interactive look inside the jet center and walk around the planes. Jack Erhart, A 360-photographer, is a specially trained to create Google Business Photos. 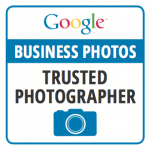 He earned the certification of Google Trusted Photographer last year. Access Publishing shoots virtual tours of San Luis Obispo County businesses and uploads the photos to enhance local search results. Google business photography is a new extension of Street View technology, allowing public businesses to showcase the inside of their places. The search company works with local photographers who have to complete extensive testing before they are approved. In addition to airports, restaurants, bars, nightclubs, hotels, and local retail shops are some of the most best businesses for an online tour in San Luis Obispo. Some of the major reasons businesses choose to take advantage of online tour include engaging potential customers, standing out in search results, and showing their business in the best light. Virtual tours taken by Access Publishing can be embedded on websites and shared on Facebook and other social media. Call Access Publishing for an online tour in San Luis Obispo today. (805) 226-9890.